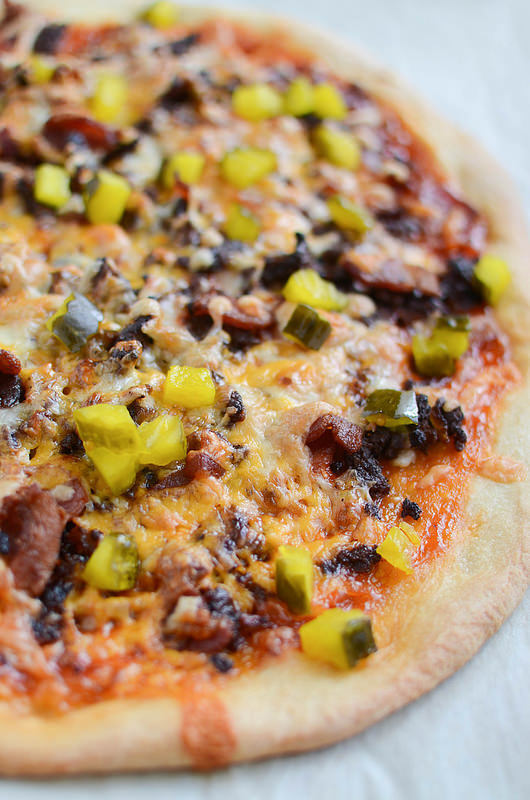 Bacon Cheeseburger Pizza – homemade pizza with burger sauce, ground beef, crispy bacon, 2 kinds of cheese, and pickles! 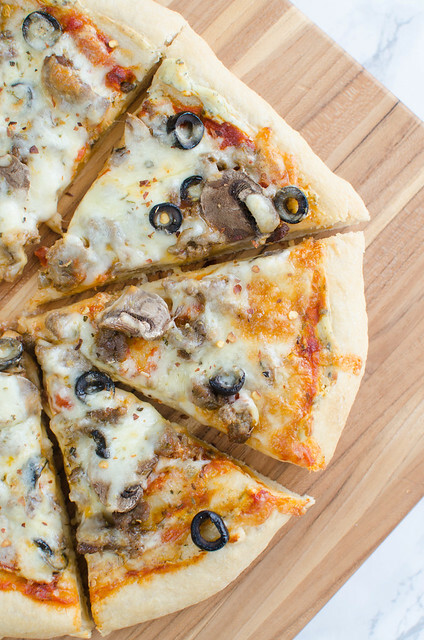 The perfect way to change up pizza night! It should come as no surprise to anyone that I’m obsessed with bacon. I mean, I’m always obsessed with bacon but right now, I’m super obsessed. I will put bacon on anything and everything. Even cake. 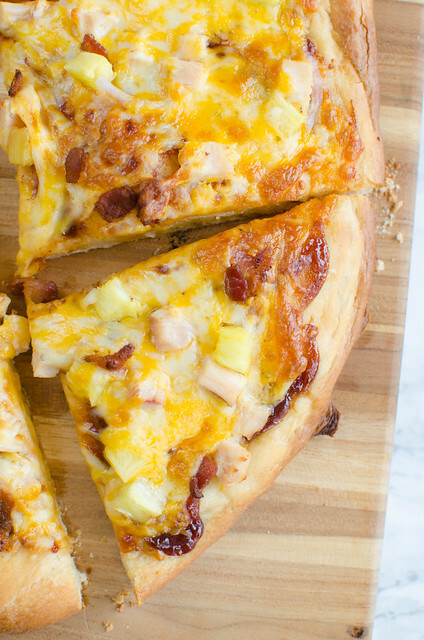 One of my favorite ways to enjoy bacon is on pizza. If you’ve ever seen any of my pizza Instagrams (they happen frequently), you know that I order my pizza exactly the same way every time. Barbecue sauce, ham, pineapple, tons of jalapeños, and BACON. No one ever wants to share a pizza with me and I can’t figure out why. 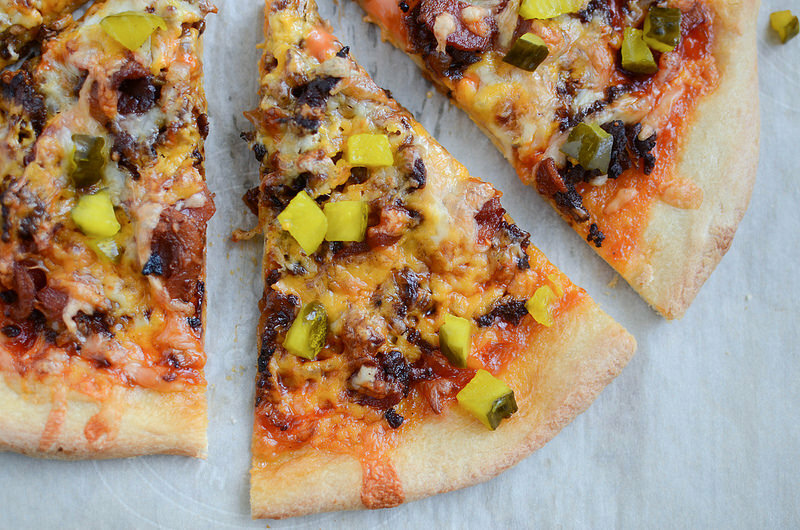 Anyway, I’ve been switching things up recently and have found myself in love with Bacon Cheeseburger Pizza. Except no one does a good cheeseburger sauce so I’ve been making this myself. Yeah. Just ketchup and thousand island dressing. But it’s so good. I’ve been using Wright® Brand Bacon for all my bacon needs. It’s so delicious and a great value at Walmart. Wright® Brand Bacon is a bigger better bacon so it’s perfect for lunch, dinner, or hey, even cake. I won’t judge you. 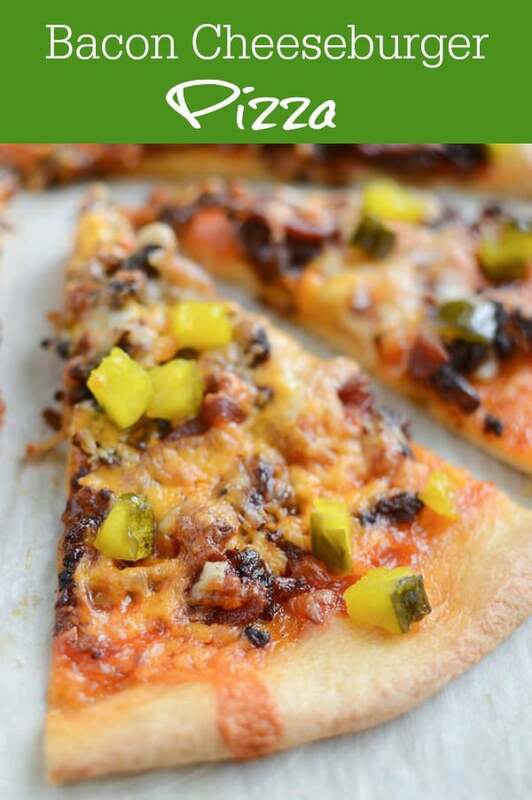 So this this pizza I used the cheeseburger sauce, the Wright® Brand Bacon, some ground beef, shredded cheddar and Monterey Jack, and topped it off with pickles. This pizza is so delicious. My kids loved it, I loved it, there was none left for my husband to try. You know how we do things around here. Preheat oven to 450F. Shape the dough into a large circle and place on a parchment-covered baking sheet. In a large pan, heat oven oil over medium-high heat. Add ground beef and onion. Cook, breaking up the meat as you go, until the onions are translucent and no pink remains in the meat. Add worcerstershire sauce and stir to combine. Let cool slightly. To make the sauce, whisk together Thousand Island and ketchup. Spread this sauce over the pizza crust. Sprinkle the meat mixture over the sauce, followed by the bacon and shredded cheeses. Bake 10 - 12 minutes or until the pizza crust is browned and cooked through. Sprinkle with pickles after you remove it from oven. 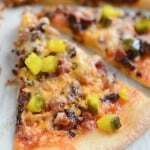 10 Responses to "Bacon Cheeseburger Pizza"
This pizza looks amazing!!!! I love this. . especially the diced bread and butter pickles on top!!! love this recipe! We seriously only eat Wright’s bacon. It’s the best. I love this pizza so much more than a regular burger! 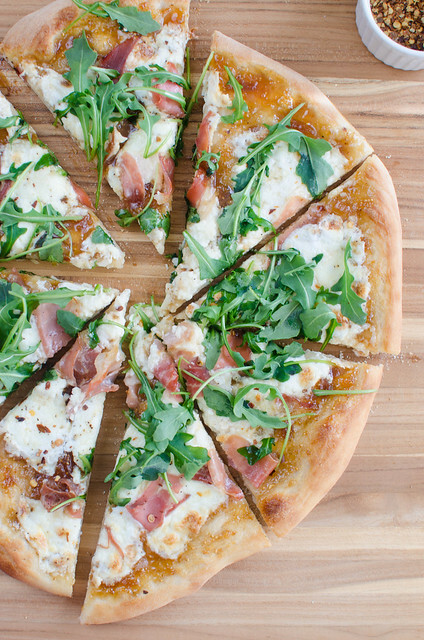 I would say that no one wanting to share with you wouldn’t be that bad of a thing ;) And this pizza combines so many great flavors! Pinned! such a fun way to do pizza! Oh my goodness. THIS IS THE BEST IDEA EVER! Pinned! 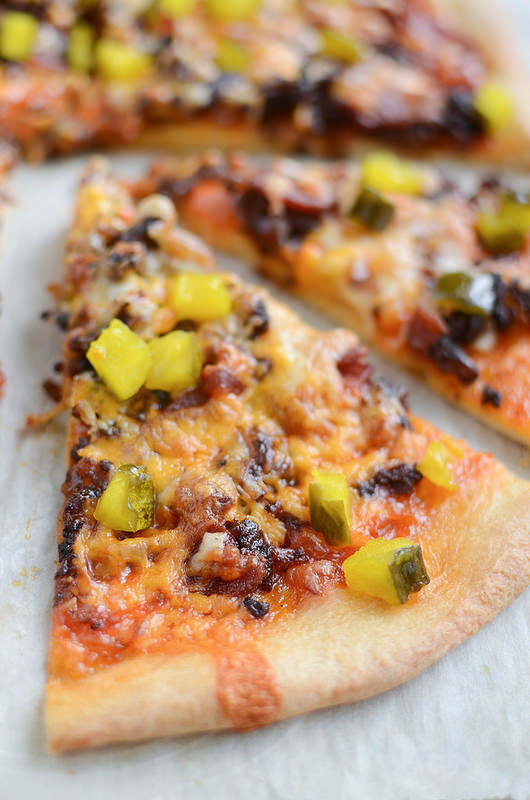 Pickles on a pizza?? Genius! This looks totally addicting and amazing!! I’m loving this pizza! This combo sounds great! !